Ruggedly handsome, the nautical sundial and compass brass accessory is a piece of history that has been indespensable to pirates, sea captains and travelers for centuries. 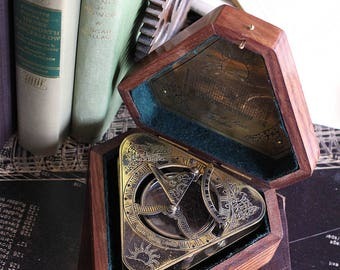 Nestled on the corner of a desk, the compass and sundial accessory is a piece of navagation history thats still used today. If the appeal of modern technology has faded and your feet are itching for adventure then bring along this conversation piece to help guide your way around the world. 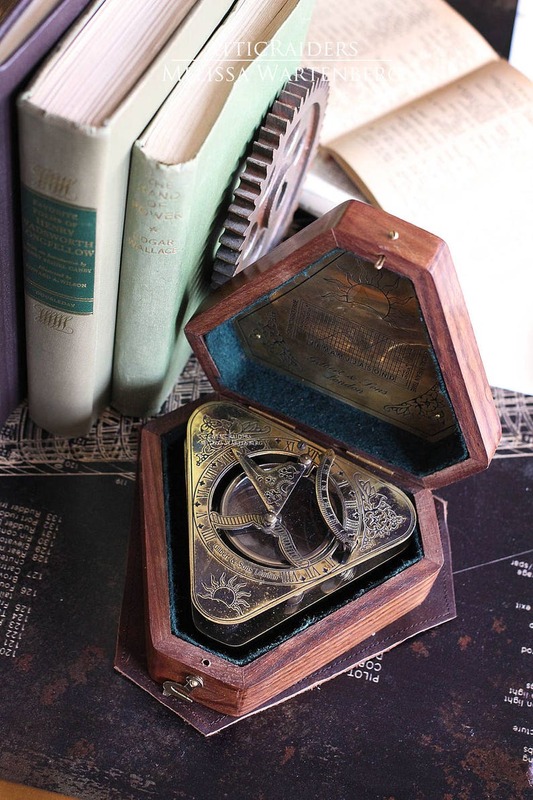 Using real brass and glass to fashion a fully functional triangular shaped compass and sundial, this accessory is completed with its own custom rosewood box that hooks closed and comes with a brown leather mat for display purposes. The style of the past comes to life once more with this piece of alternative, functional style to use to guide your way.Also featured with this accessory is a calendar chart showcasing how to calculate the Local Mean Time, a way to devise a uniform time scale at a specific longitude when the sun is clouded over rendering the sundial useless. Mean Time is a measurement of time still strongly used in navigation and astronomy today. If your a traveler, a sailor or just looking for an interesting piece to gift for a wedding or recent graduate, consider the practical gift of a compass sundial richly framed inside a dark rosewood box as the piece to give. - stock images have been used for this listing. A cheaper shipping option is available but selecting a shipping option with no tracking number or insurance makes the item Final Sale and is then not available for repairs, replacements or refunds of any kind. *- Items are shipped with tracking and insurance to ensure that your purchase is handled and shipped in the safest manner while being delivered to you. For more information about the shipping and handling policy, please see the AtticRaiders policy page. - Please note that the color settings of the monitor you are viewing this item may slightly alter the color of the item pictured above. Ask questions about this item so you are confident in you purchase. -This item, after full purchase, is checked for any defects, scratches etc. before being processed and shipped. All shipped items are determined to be in excellent shape and condition to be then shipped to the recipient. Got questions about your received item? Send a PM to AtticRaiders and I’d be happy to chat! - Please be advised that all ocular items made and sold through AtticRaiders are intended for costume use only. None of the ocular items have been rated for safety use, do not meet any safety standards and are not recommended to be used while operating large equipment. - Any and all body parts, backgrounds, background stuff and other things in the pictures are not included in the sale of this item. Parts are not replaceable if and not limited to, broken, stolen, lost, etc. 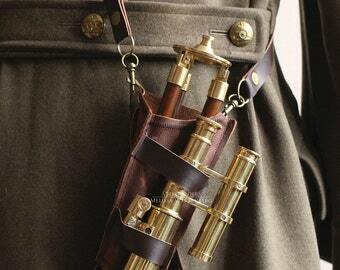 - I nor Attic Raiders do not and cannot be held accountable should any injury occur while misusing this item in any, though not limited to accidental, irresponsible and/or other means of play etc. 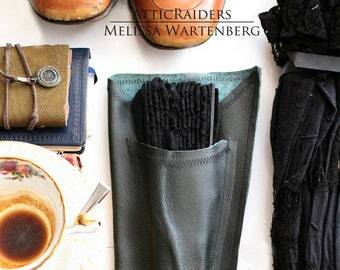 - AtticRaiders retail products do not include the images in the sale of the item(s) upon successful purchase. Please check back to my Etsy shop often as new accessories are always being introduced. Copyright © 2009-2017 and beyond belongs solely to AtticRaiders. The content herein, including but not limited to, all intellectual property, designs, materials and the selection and placement thereof in such designs, copy, text, photography, listing format and content is the sole and exclusive right of AtticRaiders and its subsidiaries and any attempt to copy or reproduce any of such designs, copy, text or content, by any means, electronic, manually, visually or otherwise is prohibited by law and all infringements, intentional or otherwise, shall be prosecuted to the full extent of the law. Permission is granted for the use of images, text and content for the purpose of promoting the work contained herein in cases in which AtticRaiders is recognized and acknowledged as the sole creator of the work in question. The tea kit arrived beautifully packaged and was just as described. I gave it as a gift and the recipient loves it! Thank you for the beautiful and well made work! I will definitely be back. Q: What kind of payment options are there for in store purchases? ~ The payment options available will be shown at the time of check out. AtticRaiders accepts Paypal, Etsy gift cards and most major credit cards as form of payment. Q: I can’t make full payment on my recent purchase from your store; can I make a partial payment? ~No, if full payment cannot be made on an item IN-STORE that’s ready to purchase, please ask me to place the item on hold instead until a full and successful payment can be sent. Q: Can you put an item on hold for me? Any item IN STORE that has been put on hold will be put on hold for one (1) week/five (5) business days only. If the item is not paid for by the end of the five (5) business days then the item will become available to the public for purchase again and your hold on the item will be removed. AtticRaiders reserves the right to refuse a hold on an item. Q: How long do I have to make payment for my purchase in your shop? ~ Please make a full and successful payment when choosing to purchase an item from AtticRaiders within five (5) business days. - Partial payment plans (Layaway plans) are not available. Q: Oops, I made a purchase but I changed my mind. What do I do? ~You can contact me here on Etsy to cancel the order. Q: What about taxes and extra fees, do you pay that or do I? ~You the buyer are responsible for any additional fees that may occur. This includes but is not limited to, border fees, country tax, insuficient funds bank fee, etc. Q: I got my item but I don’t like it, can I get a refund? ~Yes, after the item has been shipped back and has arrived in my hands, I would be happy to refund you. Please ship the item with a tracking number so we both know that the other has successfully recieved the returned parcel. Additional costs incurred to return an item, for this reason, are paid by the customer. *If you are not pleased with your purchase, please contact me at your earliest convenience within 14 buisness days dated from the date of confirmed delivery displayed on the Canada Post tracking page results for your order. Please give me the chance to make things right before you leave a review of 3 stars or less. 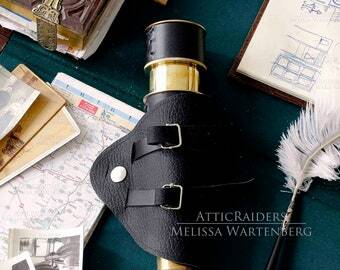 **If you choose to leave a negative review, AtticRaiders will not issue an item cost refund. *SHIPPING COSTS ARE NOT REFUNDED (Including the return shipping costs); they are the buyer’s responsibility to pay. Q: How long do I have to return the item? ~The buyer has 14 days, starting from the date that is marked on the Canada Post tracking page that the parcel was successfully delivered, to ask for a refund before a refund is no longer an option. Q: What are ACCEPTABLE reasons for a return? Q: What are NOT ACCEPTABLE reasons for a return? *there will be an additional fee to ship the purchase to the client again. Q: I’ve worn my item but want to send it back, can I get a refund? ~No, worn items can not be returned. Q: Why can’t I be refunded all of my money? ~ The shipping costs are paid to a third party, the post office, for a service to deliver the purchase to you and is not in my possession or ability to be refunded. The shipping fee is non-refundable. Q: Can I exchange an item I purchased and sent back with something else I like in your shop instead? ~ Yes, I'd be happy to organize an exchange with you! Please message me through the Etsy private messaging system and I'd be happy to assist you further. Q: My item hasn’t arrived and I’ve checked my post office for it and checked the status of the item online, what happens now? ~ If an item is lost and has not arrived in your hands after 30 business days have passed since it was marked as shipped, please message me on Etsy and I would be happy to open a Lost Item inquiry with the postal office if applicable. *PLEASE NOTE: Lost items are only refunded after the inquiry has been closed and the Postal office has refunded me the value of the lost item. The amount will then be refunded to you through PayPal. Q: Can I call you to discuss refunding with you or meet you in person? **Please see CUSTOM ORDER POLICIES for details if a custom order is lost in the mail. Q: How do you ship your items? ~ All purchases are shipped in a sturdy box, are well padded and sent with an automatic tracking number to destinations in the USA, Canada and International. International destination shipping fees cover International Surface AIR shipping. This includes a tracking number for the safety of your purchase and the peace of mind for us both. Should you want a cheaper shipping option, limitations will begin to apply but you may ask for a different shipping option to save money OR save time. A message will be sent to you to inform you that your purchase has been sent and a link to the Canada Post website tracking page is included in the message so you can easily check the progress of your purchase at anytime. Q: Can I have my purchase shipped to arrive sooner? ~Yes, please contact me on Etsy for a different shipping cost estimate. Q: That’s a steep shipping fee, why is it so high? ~The shipping fee pays for a shipping option that includes a tracking number for all of the contents shipped. It is the most accurate flate rate currently available. Charging for a shipping option with a tracking number and insurance means ,in the rare case, if AtticRaiders needs to open a claim about a lost and/or damaged package, having that tracking number and full content value listed means the claim may fall in our favor for compensation. I believe in fair shipping costs and do my best to offer a reasonable shipping fee for each item. With tracking on the purchase, we can easily track the package at our convenience and be reassured that our package is safe. Q: Can you ship it any cheaper? ~Yes, however please be advised that with NO TRACKING NUMBER MEANS NO REFUND! A cheaper shipping option forgoes any ability to track the parcel, disables the option for an exchange, repair, refund, exchange and return between AtticRaiders and the purchaser. Choosing a shipping option with no tracking makes the item FINAL SALE. I don't own the shipping companies nor can I foretell the future for when unexpected events occur that may delay a package from being delivered on time. When making a purchase, please consider the possibility that the item may be delayed for reasons outside my influence. ** It is in your best interest to personally monitor your tracked package while it is enroute. If you notice an issue, please call your local post office or Canada Post to assist you. I only know as much as you do, based on the results displayed on the Canada Post tracking information page. Q: Will the shipping fee change at anytime? ~All shipping estimates may be changed on short notice. Q: Do you ship the same day? ~All non-customized items that are sold and paid in full are shipped within 1-5 business days. Q: Can I meet you somewhere locally to pick up my purchase? ~I’d be happy to meet you at a convention I’m attending as a vendor/artist and drop off your purchase with you there but otherwise no, I do not do local drop offs. Q: I received my parcel but I have to pay the postal office for it, why is that? ~The extra fee may be one of the additional costs that may occur while the parcel was traveling. It could be, but is not limited to, a border tax, province tax, processing fee, etc. *This fee is not paid by AtticRaiders or myself and is the buyer’s responsibility to pay it. This additional cost has nothing to do with the original postage fee. Q: Can you stop a parcel after its been dropped at the post? ~ No. Once its sent, its sent and AtticRaiders cannot stop or recall a package. Q:I recieved an order but its not what I purchased, what do I do? ~ a duplicate item or an item of equal or lesser value chosen by you will promptly be prepped to be shipped to you. ~ your choice will immediately be arranged for the fastest shipping option available to deliver the item to the address listed on the original purchase receipt, unless asked for otherwise. ~ if an item of lesser value has been selected to be sent in response to a mix up error by AtticRaiders, a refund of the difference in the cost will be issued via Etsy to you. Q: I used the wrong address to make my purchase. What do I do? ~ If your order has been shipped already, there isn't anything I can do as I cannot call the post office and ask them to send the package back after it's been processed. ~ If the order has NOT been shipped, the order will be cancelled and the customer will be encouraged to complete a new order with the correct address information provided. (!) Shoppers are responsible for maintaining the information on their profiles, which includes an up-to-date address. AtticRaiders cannot be held responsible for a wrong address provided by the customer. Copyright © 2009-present and beyond belongs solely to AtticRaiders. The content herein, including but not limited to, all intellectual property, designs, materials and the selection and placement thereof in such designs, copy, text, photography, listing format and content is the sole and exclusive right of AtticRaiders and its subsidiaries and any attempt to copy or reproduce any of such designs, copy, text or content, by any means, electronic, manually, visually or otherwise is prohibited by law and all infringements, intentional or otherwise, shall be prosecuted to the full extent of the law. Images are the sole property of AtticRaiders and are not included in retail sales. Images are not for sale and are not available for photo shop interpretation. - Sorry, custom orders are not accepted by AtticRaiders. 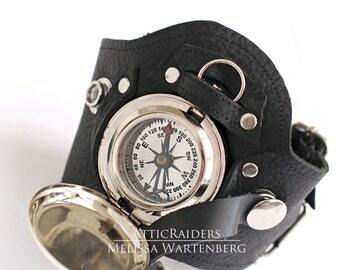 AtticRaiders accessories are not to be resold. Buyers caught reselling AtticRaiders work will be denied future purchases from the store. For purposes of EU data protection law, I, Melissa Wartenberg , am the data controller of your personal information. Thank you for taking the time to become an informed buyer. Your time to read this policy page means a lot to me. Thanks again and enjoy the rest of your browse through the attic!